A NASA spacecraft circling Saturn has discovered a wispy oxygen atmosphere on the ringed planet's icy moon Dione, but you wouldn't want to live there. For one thing, you wouldn't be able to breathe — Dione's atmosphere is 5 trillion times less dense than the air at Earth's surface, scientists say. Dione's atmosphere was detected by NASA's Cassini spacecraft, which spotted an ultra-thin layer of oxygen ions so sparse that it is equivalent to conditions 300 miles (480 kilometers) above Earth. On Dione, there is just one oxygen ion one for every 0.67 cubic inches (or one ion for every 11 cubic centimeters) of space, but it's still enough to qualify as an atmosphere, Cassini mission scientists announced Friday (March 2). "We now know that Dione, in addition to Saturn's rings and the moon Rhea, is a source of oxygen molecules," Cassini team member Robert Tokar of the Los Alamos National Laboratory in New Mexico, who led the new study, said in a statement. "This shows that molecular oxygen is actually common in the Saturn system and reinforces that it can come from a process that doesn't involve life." The oxygen on Dione may potentially be created by solar photons or high-energy particles that bombard the Saturn moon's ice-covered surface, kicking up oxygen ions in the process, Tokar explained. Another idea suggests that geologic processes on Dione could feed the moon's atmosphere, researchers added. The study is detailed in a recent issue of the journal Geophysical Research Letters. Dione is by no means the only rocky body with an atmosphere in our solar system. Thick atmospheres cover the planets of Earth, Venus and Mars, as well as Saturn's largest moon Titan. A thin atmosphere on Saturn's moon Rhea — one similar to that of Dione — was also detected in 2010, NASA officials said. That observation and the discovery of ozone on Dione by the Hubble Space Telescope led researchers to suspect it may host a thin atmosphere. But it wasn't established for sure until the Cassini spacecraft used an instrument called a plasma spectrometer to detect the ionized oxygen on Dione during a close flyby in April 2011, when the probe flew within 313 miles (503 km) of the icy moon. The spacecraft detected an atmosphere made up of about 2,550 oxygen ions per cubic foot (or about 90,000 per cubic meter), researchers said. "Scientists weren't even sure Dione would be big enough to hang on to an exosphere, but this new research shows that Dione is even more interesting than we previously thought," said Amanda Hendrix, the deputy project scientist for Cassini at NASA's Jet Propulsion Laboratory, Pasadena, Calif., who did not participate in Tokar's study. "Scientists are now digging through Cassini data on Dione to look at this moon in more detail." Dione was discovered in 1684 by astronomer Giovanni Cassini, after whom the Cassini spacecraft is named. 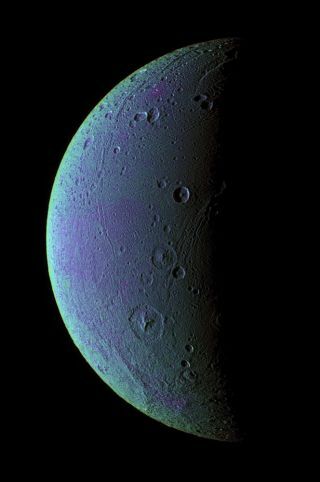 The moon is named after the Greek goddess Dione, who the ancient Greek poet Homer described as the mother of the goddess Aphrodite, NASA officials explained. NASA launched the Cassini mission in 1997 and it has been orbiting Saturn since its arrival at the ringed planet in 2004. The mission, which is a joint effort by NASA and the space agencies of Europe and Italy, has been extended several times, most recently until 2017. This story was updated to correct the density of Dione's wispy thin atmosphere.